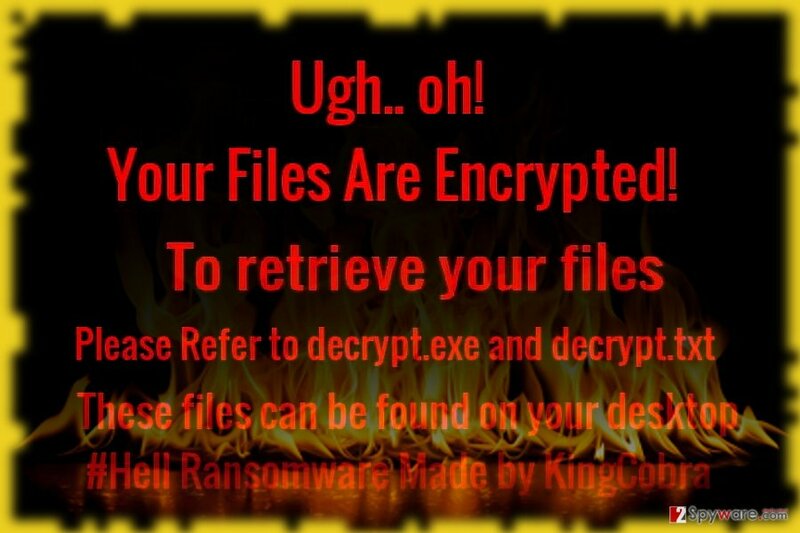 Radiation ransomware uses sophisticated techniques to infiltrate computers and hide from its victims. Use Reimage to determine whether your system is infected and prevent the loss of your files. Radiation or alternatively called Hell malware functions as an ordinary file-encrypting threat. Regarding the title, it seems to be named after the outbreak of menacing NotPetya/Petya virus which hit especially inflicted significant damage on Ukraine, particularly Chernobyl power plant facility. Luckily, the malware does not happen to be so developed as the latter threat. However, it messes up with the files without properly encoding them. It does not append any specific file extensions. The crooks did a good job in developing users‘ interface. The software which is entitled as Radiation ransomware presents three options. 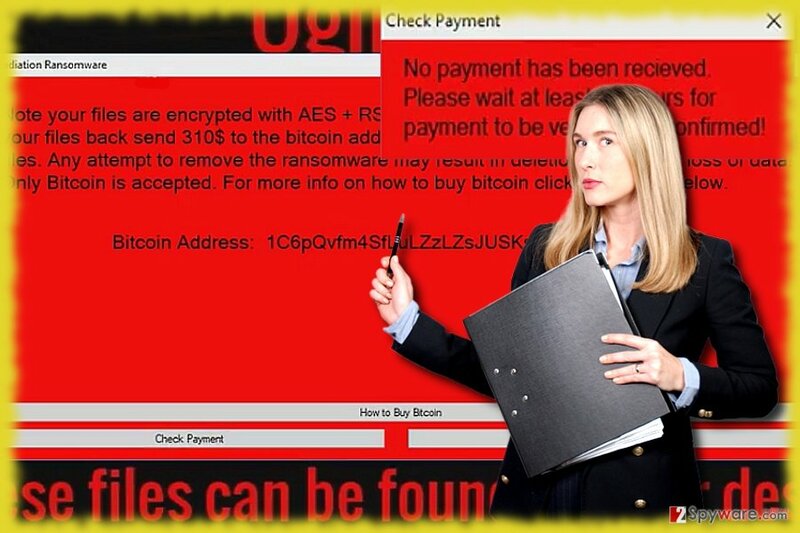 Besides indicating the bitcoin address, it also changes the desktop background picture. According to it, Hell malware was programmed by KingCobra. It is quite common nickname in the virtual space, so you there are fewer chances to trace the identity of a hacker. What is more, it also suggests the character of this perpetrator: observing the events in the cyber world, this wannabe crook also seeks attention. They do not seem to be an organized gang of cyber criminals. Nonetheless, you should make haste to remove Hell/Radiation threat. For that, you might make use of Reimage or Plumbytes Anti-MalwareMalwarebytes Malwarebytes. While indeed there are such threats as Cerber or DharmaLocker which continue terrorizing the virtual community from time to time, there are more low or mid-complexity threats drafted by wannabe hackers seeking temporal glory. Usually, the ransom notes are exaggerated attempting to invoke a sense of hopelessness to victims. In this regard, Radiation does not differ much as well. It states to use AES and RSA encryption algorithms. The malware also leaves its files in the %Temp% folder. According to its main executable file, ChaseBot.exe, it seems that the malware is capable of continuing its process even after a reboot. It is fortunate that the malware is not fully developed which grants time and opportunities for cyber security forces to come up with a solution. If you were unlucky enough to get infected with the malware, do not hesitate to initiate Radiation/Hell removal. The author of Hell/Ransom virus carefully thought it over how to foist malware in multiple executable files. Naturally, if you go browsing clicking here and there, the chances to run into malware significantly rocket. Note that current phishing and hacking techniques are so exquisite as you do not only need to click on an infected link or file but just hover over it. Furthermore, you might alternatively accelerate Radiation hijack by extracting the contents of a corrupted spam email message or installing a fake Adobe Flash Player. In addition, you should be wary of browser extensions as well. In order to lower the risk of a hijack, combine your vigilance with the operation of virus elimination tool. As the majority of file-encrypting threats, this one also targets Windows operating system. In order to curb the infection, you will need to terminate the malware with the help of a cyber security tool. Taking into account that the malware spreads its files to different locations, including system files, it is not surprising if Radiation removal does not complete from the first attempt. In that case, reboot the system into Safe Mode and access an anti-spyware application. In that case, you should be able to remove Hell/Radiation virus completely. If you happen to reside in Austria and encountered this malware, you might find our Hungarian version of 2-spyware useful. Safe Mode often is used in dealing with elaborate crypto-viruses. It should grant you access to your anti-malware application. Log in to your infected account and start the browser. Download Reimage or other legitimate anti-spyware program. Update it before a full system scan and remove malicious files that belong to your ransomware and complete Radiation removal. When a new window shows up, click Next and select your restore point that is prior the infiltration of Radiation. After doing that, click Next. Once you restore your system to a previous date, download and scan your computer with Reimage and make sure that Radiation removal is performed successfully. Guide which is presented above is supposed to help you remove Radiation from your computer. To recover your encrypted files, we recommend using a detailed guide prepared by 2-spyware.com security experts. If you failed to backup your files beforehand, this utility might be of use to you. This utility functions on the basis of shadow volume copies. Thus, there are high chances that you may suceed in restoring the files this way as there is no mention that the virus is programmed to delete these copies. At the moment, there is no such tool available. Do not get tempted to purchase the one promoted by the hackers. 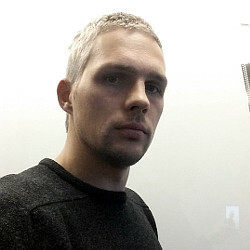 ^ Andrej Ivanov. Hell Ransomware. ID Ransomware Blogspot. ^ Phishing scam looks like BBB, but it's not. Huntington News. ^ How to remove computer viruses. IT New,s Reviews, Tutorials and Virus Removal Guides. This entry was posted on 2017-07-03 at 04:29 and is filed under Ransomware, Viruses. You can quickly scan the QR code with your mobile device and have Radiation ransomware virus manual removal instructions right in your pocket. How did you remove Radiation virus?